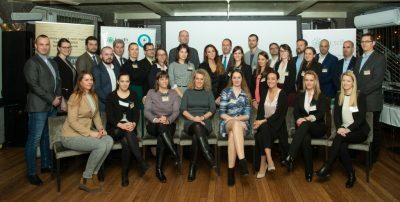 The 6th year of BCSDH’s “Future Leaders” Talent Program has been launched with the participation of 35 talented young leaders, the opening ceremony was held on 15 January, in Budapest. 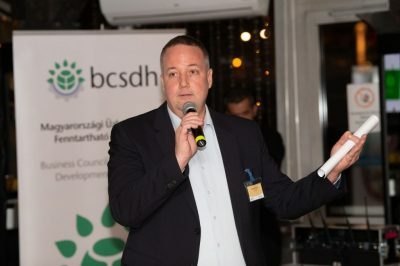 The purpose of the Business Council for Sustainable Development in Hungary’s (BCSDH) unique program – based on the World Business Council’s international program- is to present the complex corporate system and ongoing practices of corporate sustainability for those future leaders, talented professionals, that could become company leaders, thus helping their work throughout their managerial career and make their business decisions along these principles. 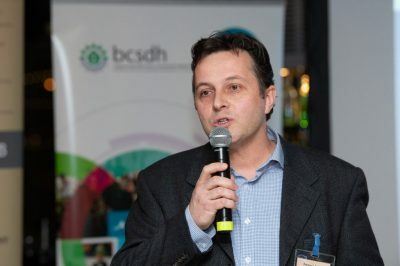 The 7 principles of BCSDH’s „Complex Interpretation of Corporate Sustainability”, completed by the topic of sustainable innovation, products and services this year, provide the best possible structure for the program, covering the most important business aspects of sustainability, that a company leader should consider. The opening ceremony of the Future Leaders Talent Program was hosted by BASF Hungária Kft. and MVÜK at Spoon The Boat Restaurant, where the selected young leaders met for the first time and could also learn about the mentors supporting the program. “It is a great pleasure to see how the program’s primary goal is being fulfilled, since it is reaching the number one and top executives of the future more and more efficiently. Many of that 130 students of the previous courses have become the catalysts of the sustainability processes in their own organizations, or even new ones. The results of the Paris Climate Summit, and last year’s IPCC report made it clear that there is no time for waiting, there is now a real need for responsible, forward-thinking company leaders in order to reach our goals”– highlighted in her opening speech Irén Márta, Managing Director of BCSDH. “BCSDH’s Future Leaders Talent Program is a practice-oriented training course, whose benefits can be seen in the daily operations of each company. BASF has been delegating participants to the program for years, and this year the number of colleagues who can get acquainted with the best practices of BCSDH’s member companies is expanding to seven. 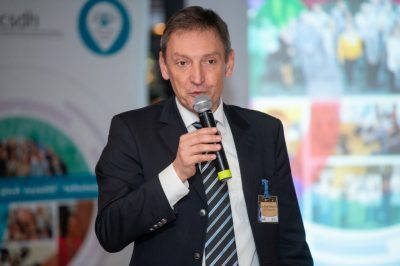 However, the impacts of the program go way beyond individual benefits: the acquired knowledge not only benefits their professional and private lives, but they can also share it with their co-workers so that it can be integrated into the corporate culture.”– said Dr. Thomas Narbeshuber, Managing Director of BASF Hungária Kft., at the opening event. Attila Baranyai, who has graduated from the program last year, said that during the course of this unique training, he had mastered such a sustainable, responsible approach and a way of thinking, that would accompany him throughout his career and also his private life. He met like-minded leaders, with whom he still is in contact, and by joining the Alumni, he got a community, that can help and inspire each other on this path. 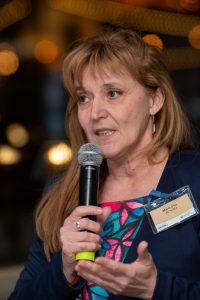 Zita Szederkényi, Head of the Future Leaders Talent Program, presented the details of the program and introduced the mentors of the 25 member companies. 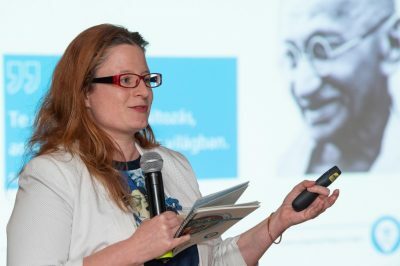 This diverse program is unique in Hungary as participants become acquainted with a theoretical and practical knowledge of corporate sustainability, and the program helps them to learn and develop through factory visits, case studies, discussions, CEO interviews, professional lectures, and interactive exercises. During the training events, participants get insight into 31 companies’ operations from a variety of industries. The closing program of the event was led by János Horváth, CEO of MVÜK Zrt. The participants could take part in a business networking developed by the MVÜK. 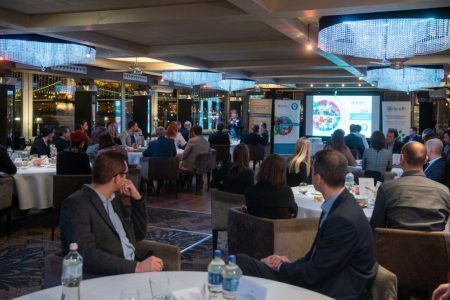 During the evening, they were introduced to each other in several rounds at different tables, while sharing which business area they were dealing with, the challenges they have faced and what they were most proud of in terms of sustainability. We are grateful for BASF Hungária Kft. and MVÜK for hosting this event. BASF, Budapest Airport, Coca-Cola, Coface, Continental, Daikin, E.ON, Eisberg, Essity, GE, Generali, Grundfos, Hungrana, KPMG, LeasePlan, MagNet, McDonald’s, METRO, MOL, MVM, Nestlé, PPD, Prímaenergia, Randstad, Shell, Syngenta, Unilever. Among the participants there is Réka Mikolay, winner of the scholarship for university students and presently a student of Corvinus University of Budapest, taking an M.Sc. This year’s most important mentoring companies: ALTEO Group, BASF, BDL, Budapest Airport, Coca-Cola, Cothec, Dandelion, eisberg, E.ON, Essity, GE, Grundfos, Inest, KPMG, MagNet Bank, McDonald’s, MOL, Nestlé, Richter Gedeon, Shell, Siemens, Szerencsejáték, Telenor, Unilever. The gallery of the event can be found here.